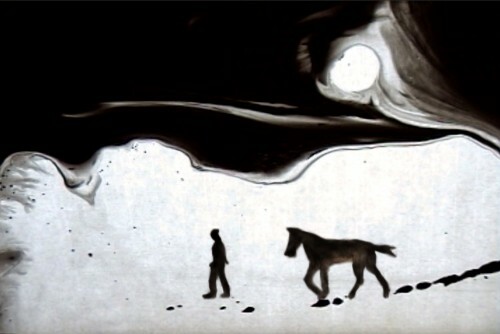 "Brain Storm" by Jennifer Wen Ma, still from video projection. Courtesy of the artist. There’s something about the approach of the winter season that always makes me want to drift away in a museum, quieting my mind by reflecting on art. A recent sojourn to the Phillips Collection to see the Intersections series did just that, and I encourage you to check it out. Too often art collections can become hidebound and resistant to change. But this museum’s founder Duncan Phillips referred to his collection as the “experiment station,” welcoming artist interaction with radical installations unusual for their time. Intersections seeks to revisit Phillips’ vision by engaging modern artists to create unique works inspired by permanent pieces in the collection. Utilizing physical space that might otherwise be overlooked, these works will help you look at the surrounding pieces with a fresh eye. There are currently three works on display as part of this series. Let’s start with a bunch of granite suspended on plain black cord. Washington artist Barbara Liotta’s hypnotic Icarus sculpture hangs from the ceiling of an almost empty gallery, tonally matched with portraits by Delacroix, Modigliani and Soutine. 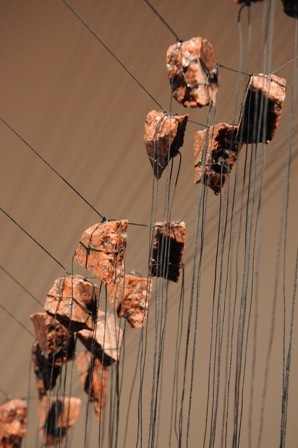 It’s a deceptively simply piece bringing to mind both the weightlessness and weight of flight. Earthy granite chunks form a swooping backbone, like the wings of a bird or some strange dinosaur fossil. Contemplate it from all angles and see how it changes. I found it a gorgeous work of art. It’s on display until January 31, 2010. "Icarus" by Barbara Liotta, detail. Photo credit: Lloyd Wolf. Jennifer Wen Ma’s video projection Brain Storm is another haunting piece, tucked into a bare room with a yellow tile fireplace. 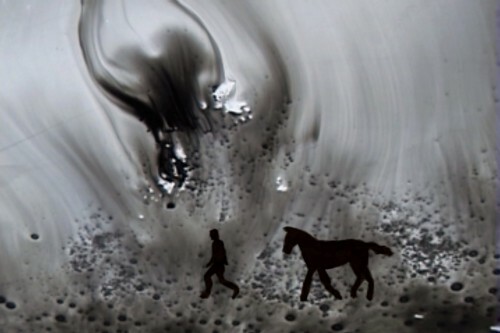 Silhouettes of a man and a horse journey through a black-and-white landscape that mutates, while they remain the same. A rising storm of sound eventually drowns them out. It’s a beautiful evocation of travel, of solitary determination, paired with similar themed works by Cezanne, Dove and Kandinsky. On display until January 3, 2010. 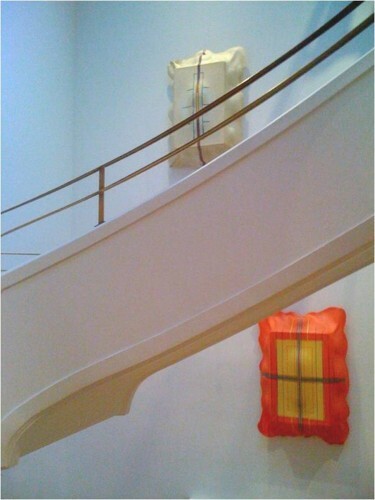 The third installation is Tayo Heuser’s Pulse sculptures, placed up the museum’s elliptical stairwell. The most effective use of what would otherwise be dead space, they’re inspired by the Mark Rothko collection at Phillips and deserve a close look. What initially looks like stone surface is actually very thin handmade paper molded into fluid shapes and painted in ink. They will be in place the longest, until October 31, 2010. "Pulse" sculptures by Tayo Heuser. Photo courtesy of The Phillips Collection. Intersections will continue through next year and rotate installations through 2011. I’m excited to see what’s next and spend other afternoons being quietly challenged by art. These exquisite pieces look like they are meant for the staircase of the Phillips Collection. They add another dimension and look like they are breathing and pulsating. I have been to see these pieces twice. They are even better in the light of day. On the first visit, I thought the red piece was the star, but now I have other favorites, like the beige pieces upstairs and the circles. Tayo Heuser’s “Pulse” installation at The Phillips is incredible to behold as you ascend the staircase. I had the pleasure of being at The Phillips for opening night of Tayo’s exhibit and to hear lectures by all three artists as they described their works on display and their body of work as a whole. Tayo showed a video of the making of the “Pulse” collection and it displayed an artist in love with her art. What is striking about Tayo’s exhibit is the physical labor involved in creating each of the roughly 13 pieces on display…from making the paper and the seemingly pulsating molds, to shaping the handmade paper onto these molds and then the intricate lines and shapes drawn and painted by Tayo onto these objects. Having seen the exhibit three times now, I can highly recommend others go as well. Oh, and visit the Rothko room afterwards where you can then appreciate her inspiration for this outstanding installation. I agree that the Heuser pieces are beautiful, they really are deceptive in their simplicity. Tayo Heuser’s exhibit is beautiful – the organic sculptures do seem to mimic the urgent and vital pulse of the artist. Tayo Heuser’s “Pulse” sculptures gave you a feeling of being alive. They made me want to touch them. Having attended her presentation at the Phillips, I could appreciate even better her inspiration that led to the creation of these beautiful pieces, what better place to show them then in circular movement up the staircase. I will certainly go back to enjoy them again, great to know they will be around for a while. Tayo Heuser’s exhibit and presentation were in a league of their own. She created masterpieces and I was mesmerized learning how she created them. She even made the paper! As I climbed the staircase at the Phillips, I was awe struck by their splendor. I plan to return with family and friends to show them her pieces and enjoy them a new. Tayo’s beautiful ‘Pulse’ sculptures are lively and quiet at once and activate the stairwell space in a wonderful way. What a treat to see!